Portland, Oregon & Brisbane, Australia January 12, 2010 - Australia’s leading business thinker brings a new message to U.S. small business on her January book tour: the new Lean Economy is fertile ground for A Major Turnaround in 2010. 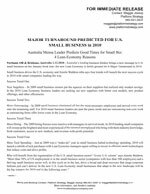 Small business drives the U.S. economy and Ainslie Waldron mba says four trends will launch the next success cycle in 2010 with smart companies leading the way. These New Years Business Resolutions will catapult your company to new heights in 2009. Eliminate your biggest barrier during January Every business has at least one roadblock to their success and it's easy to spot with this simple test for business owners: "What is the one thing that frustrates me the moment I walk into work or keeps me awake at night?"